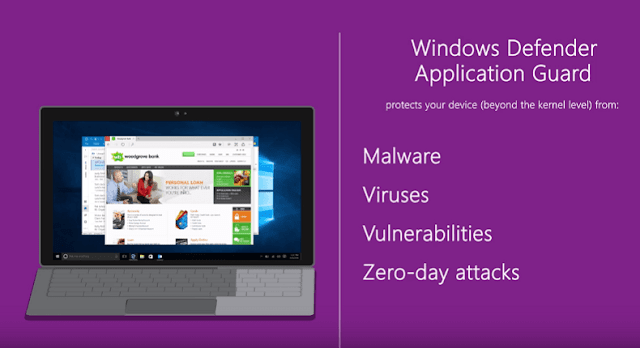 The Windows Defender Application Guard was formerly released explicitly for the Microsoft Edge browser, and works by isolating the contents of a tab in the browser from the rest of the system. Just like sandboxing, it blocks websites and downloaded files from accessing the system, thus prevents malware in the virtualized “container” access to the user’s confidential information, making it also impossible to access data or connect with other systems on a network. And as the tab is closed on shutting down the browser, or on logging out of the PC, any malware that managed to get into the container is tossed away. Microsoft extended the Windows Defender Application Guard functionality to Chrome and Firefox browsers via an extension, alongside the announcement of Windows 10 Insider Preview build 18358. The extension works the same way as in Edge browser, by crosschecking entered URL against a list of trusted websites, which when found an untrusted site, will open in a sandboxed tab, from there then navigate to the website, so as to protect your system. While the anti-malware technology had undergone some major testing under Windows Insiders running Windows 10 Enterprise, this is the first availability outside the Microsoft Edge browser. Albeit, the extension is currently available to Windows Insiders, but will be publicly available to use on Windows 10 version 1803 or higher when it's official released, though it may require Windows 10 Pro or Enterprise edition.